If you're serious about plyometrics you need to get some Plyometric Jump Boxes. By jumping onto and off of the boxes you are using gravity to build muscle. Plyometric Jump Boxes can be used with Jumpsoles for maximum gains. 12" box is great for step ups, the 18" is great for all exercises, and the giant 24" jumbo box is are great for doing depth and altitude jumps. Rock solid welded steel construction. Built to withstand extreme stress. 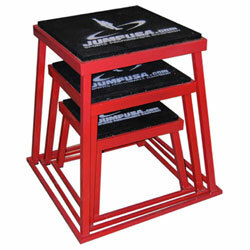 Plyometric Jump Box Set includes the 3 most popular Jump Boxes. Hi, My son and I have been using the jump box several days a week since we purchased it. I keep in shape while he prepares for his upcoming baseball season. We love it!!! It has added a new dimension to our workouts, and we see and feel the difference. Thank you for offering such a great product!!!! NOTE: The Jumpbox may appear slightly different from the picture shown. Current boxes that are shipped are white with black tops.